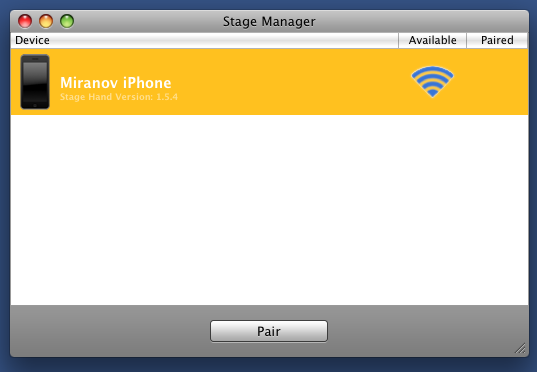 When both devices are connected, SH displays opened presentations (click on picture left to enlarge it). 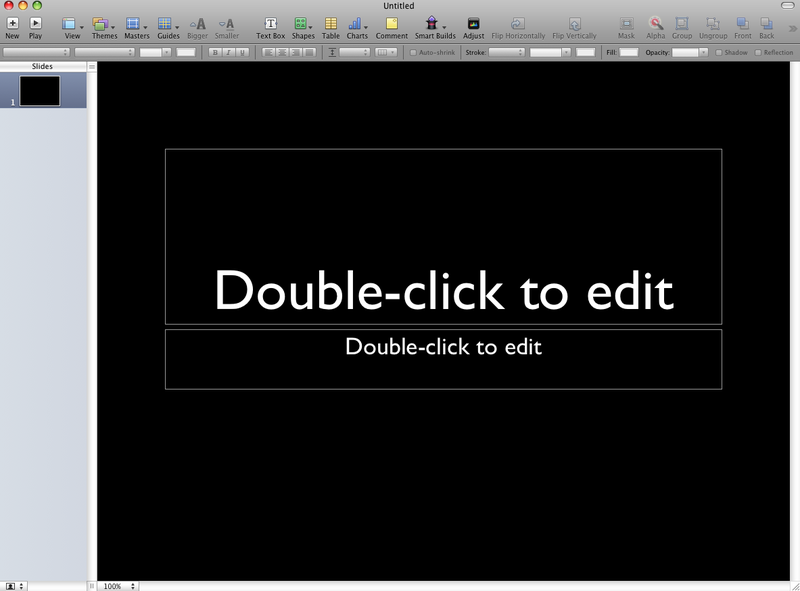 “Double-click to edit” appears when you don’t use Keynote’s Theme and when you don’t fill the Title in Theme’s layout. And if you don’t give a title to each slide (see Slika 5) below. From that menu you can open Settings and define Notes View and Slide View. 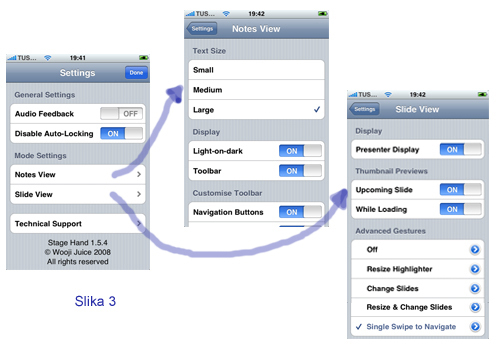 In Slide View you can determine if you want to see Presenter Display, Thumbnail Preview and Advanced Gestures (how� you will change slides and how you will use Highlighter) (click on picture to enlarge). From the Info menu, you can begin with slide show. Interesting thing: you can choose with which slide you will start. If you tap Start at, you can get index of slides in one of three forms: without thumbnail preview, with small images, and with larger images. You can reach that list of slides even during the slide show by pressing Index (see below). Images are displayed only if your Keynote presentation was saved with preview. Timer function enables your iPhone to vibrate 30, 10, 5 or 1 minute before scheduled ending. Tap Begin (see Info menu) to start slide show. If Presenter notes are attached to the slide, they will appear on the screen. Font size can be specified in menu Settings. Right above in the blue box is the number of current slide. 1/3 mean the first build of three, 0/5 none of five. Screen Blank Button (Key �B� on Keyboard). When the main screen is hidden, you cannot do anything on iPhone, but you can work on the Presenter Display on the computer. This is a great feature that I miss in the Keynote. Now I press Screen Blank Button on iPhone, then browse through slides on the computer and hit Screen Blank Button on iPhone again. This feature itself is worth buying SH. Without SH you can browse through list of slides only with “lit” image on main screen. 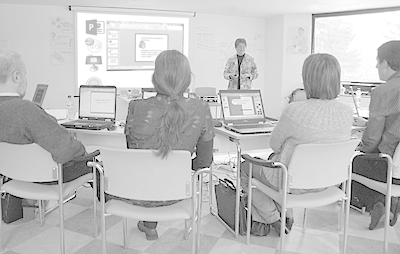 Participants otherwise don�t see, what are you doing on Presenter Display, but slide shown on main screen might be disturbing. Index opens the menu �Skip to slide�, which is similar as �Start at� menu. If the presentation is saved with a preview, you see the preview of slides. Again, we have three options: Small (no images, 9 slides at a time), Medium (6 at a time) and Large (4 at a time) (click to enlarge). The preview images appear relatively fast, but browsing through large presentation might take a while – if you do not know the number of desired slide, which could be entered with a computer keyboard. In Landscape position you change slides similar to Keynote Remote, only somehow more accurate. 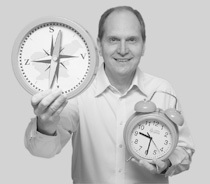 Appearance of the Presenter Display can be rearanged on the computer. With SH you can add thumbnail preview of upoming slide and preview of loading slide. For my point of view it is important to see on iPhone everyhing I see on computer. It only takes longer to display changes. Ready to advance indicator on iPhone is two to three seconds behind the one on computer. In the meantime, there is a dotted outline of the slide. 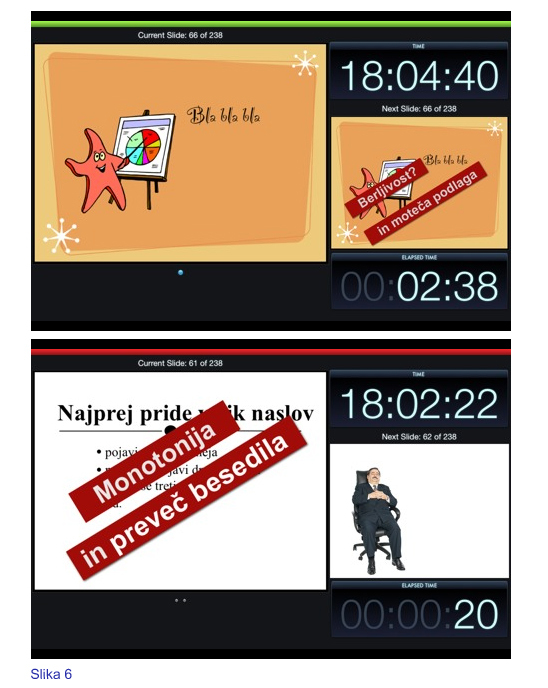 Sometimes (usually when slide has a lot of builds to perform) computer�s Presenter Display is indicating that it is prepared to advance, but Presenter Display on iPhone screen is still not ready. When the presenter is standing far away from computer, he needs to check what is happening on the main screen. Praise: Screen Blank Button, Skip to slide menu; arrows for changing slides in Portrait mode, automatic switch between Portrait and Landscape Presenter Display; the same look of the Presenter Display on both devices,� highlighter, vibro alarm, volume control. Suggestions: I wish I could see slide preview in Portrait mode, and I wish� Info key wouldn’t immediately cancel the slide show (sometimes you can hit the Info key by accident).